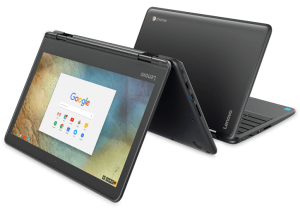 Did you know the Lenovo N23 Yoga and the Lenovo 300e Chromebook are virtually the same solutions? With the N23 Yoga, you get the same durability, versatility, and usability as the 300e with a smaller price tag. Check out this limited time offer FireFly Special Pricing and see for yourself why the N23 Yoga is a great, cost-effective alternative for your school.